Description: Design and Construction documentation services for a Spanish Mediterranean Revival home in the prestigious Paradise Valley in Arizona. The entry of the home included a redesign of the arrival sequence to immediately direct views to the resort style pool flanked by the home ‘wings’. Large Date Palms were strategically placed both on the exterior arrival and interior courtyard area to add emphasis to the axis. 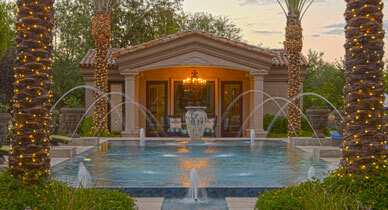 At the northern end of the property, stunning views of the renowned Camelback Mountain are clear. The Artifex10 team designed a path lined with Heritage Live Oaks to an ‘Evening Garden’ experience, which features Sonoran Desert plant life that adapts and blooms in the evening. As the sun sets, and the flowers bloom, the evening garden awakens with comfort and the beauty of the Evening Garden.